at the Global Green pre Oscars party in Hollywood. at a LoveGold even in Los Angeles. at Bulgari event in Hollywood. at an event for the Dalai Lama in Los Angeles. Well that's all I have time for, so enjoy the weekend & see you loves on Monday! Leopard is such a fun pattern to wear, & I could not agree more with Jenna. If you like leopard, but are nervous about wearing it start off with something simple like a blanket, mug, hairdryer, or iPhone cover. 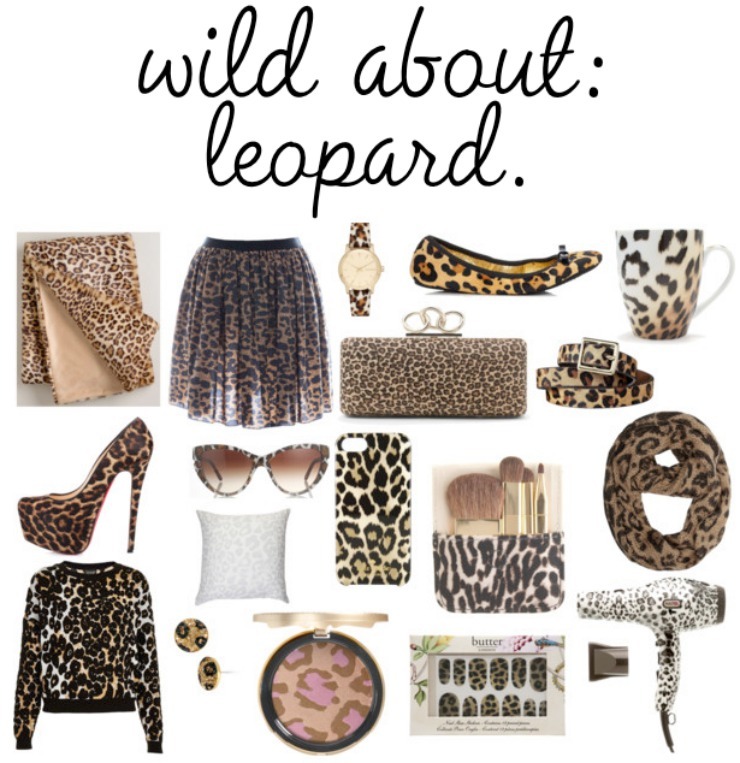 If you're feeling a little more adventurous, but still want to remain a little conservative I would recommend wearing a leopard accessory--shoes, a watch, sunglasses, earrings, a belt, nail decals, etcetera. If you really love leopard & want to go full force try a skirt or pants in the print with a black top or a leopard sweater with jeans & flats or even a dress with black shoes. There are so many cool things that you can do with this great pattern from dressing yourself in it, to decorating your home with it, to buying fun items like makeup brushes in it, you just have to take a walk on the wild side. What do you think about leopard print? 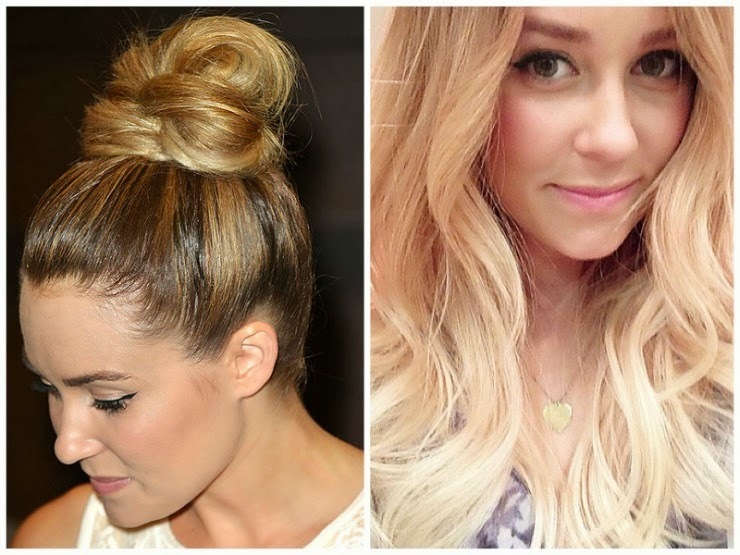 So I have a confession of a longtime girl crush: Lauren Conrad. Everything about her is just perfection & her life seems so dreamy. I would not mind walking a day (or a few) in her fab shoes. I feel like a lot of girls around my age feel this way, & feel like we've 'grown up' with Lauren Conrad since we've 'known' her since her senior year of high school. I know I've talked about her before, but I wanted today I wanted to talk about why Ms. Conrad is majorly girl crush worthy. Lauren used her reality television fame to create a wildly successful empire. While a lot of people would have fizzled after a run on a show like "Laguna Beach" (& many of her cast mates did), Lauren was smart & capitalized on the opportunities she was given. Since she was in high school she has been working, & it has seriously paid off. She is an intensely motivated entrepreneur who runs countless thriving businesses. 2. She’s an amazing writer. 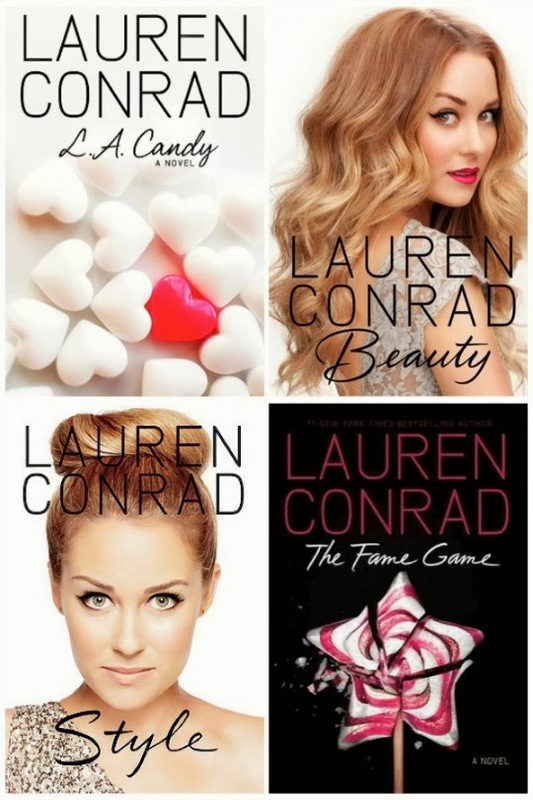 Have you read her "L.A Candy" or "The Fame Game" novels? If you haven't you are missing out! They are so well written & addictive reads. 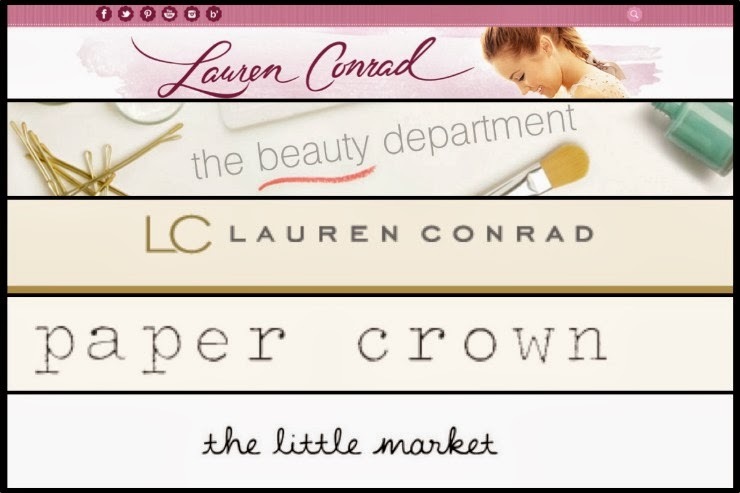 She also has a "Style" book & a "Beauty" book, which are guides filled with her personal tips & tricks on both topics. They are full of so much great information that comes in very handy. 3. She’s not afraid to put herself out there. The girl started her career on reality television--& not some trashy game show or something like that. She was willing to put herself out there to see what would come from allowing cameras to film her senior year of high school. When she did this reality TV was still pretty unchartered territory, especially the type of reality TV that "Laguna Beach" was, & I think that doing that was pretty brave. She then allowed TV cameras to film her first few years as an adult in the real world, something that is scary enough without the whole world watching (& commenting on it!). Her willingness to put herself out there landed up paying off big time for her! 4. She’s a girl’s girl. She's always had tons of girlfriends & is a true girls girl. From watching her on TV & reading interviews she seems like one of those girls that is always there for her friends & is fiercely loyal to them. 5. She’s an every girl. She seems like someone that could be your best friend & that you could go shopping with. She seems down to earth, & fun. She inspires to you to work harder so you can achieve your dreams like she has. 6. She is super stylish. 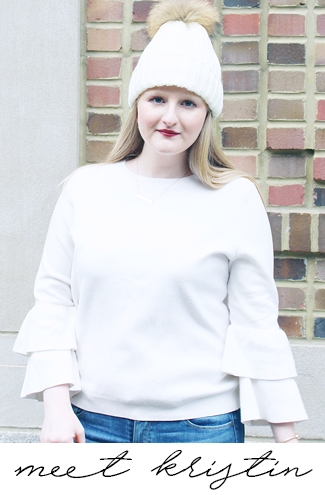 Check out my post all about her amazing style here! She's always so poised & proper. She's curated this super chic lifestyle that oozes sophistication. Her hair is always perfect! So shiny, so lush, so long! I have some major hair envy here. 9. 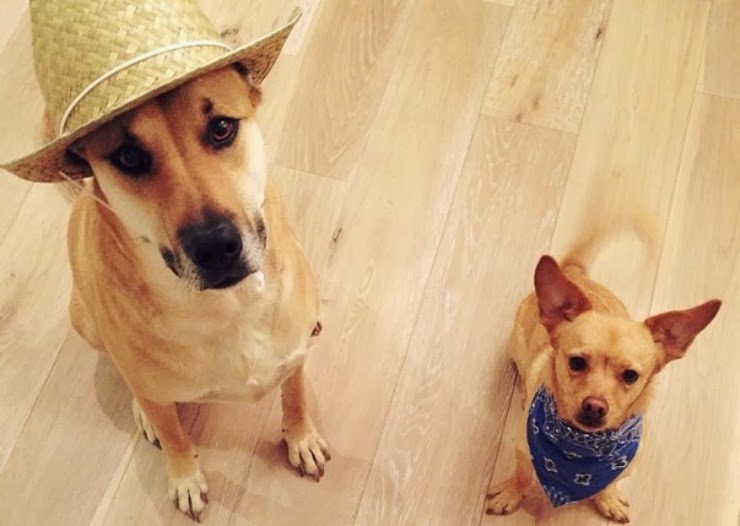 She’s got adorable pups that she rescued. She's a great mama to two super cute little fur babies, that she rescued! 10. Her & her fiancé are adorable. We watched Lauren's dating life chronicled on "The Hills", we saw her ups & downs, & were all always cheering for her. I'm so happy that she finally found her 'Prince Charming' & cannot wait to see their wedding (which is going to be Pinterest perfect)! So these are all the reasons that Lauren is major girl crush material. You should totally go watch some old seasons of "The Hills" on Netflix because I may be doing just that later. Typically when I'm running back & forth from school to home I do not bring all of my makeup with me. Unless I'm coming home for a long break or to go to an event like a wedding, I usually come home for the weekend to relax, so I don't need to be dragging a ton of makeup around with me. 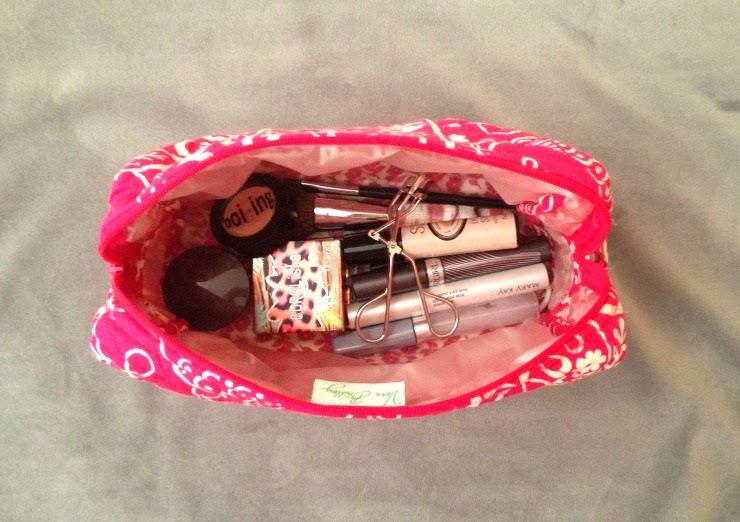 After two & a half years, I have down pact which items are my bare necessities so that I have some simple products on hand for when I need to put on a little makeup to do stuff like grab lunch or run errands. 1. Hair Tie- For some reason I can never find a hair tie when I come home so I always throw an extra one in my makeup bag before I leave. 2. Clear Mascara- I use COVERGIRL Professional Natural Lash Mascara to groom my brows, I learned this trick a few years back from a makeup artist & helps to give a much more polished look. 3. Black Mascara- As a girl with super blonde lashes this is always a major must for me, lately I've been using COVERGIRL Lash Perfection in Very Black. It works nicely, darkens my lashes without clumping & doesn't irritate my sensitive eyes. 4. Lash Primer- I love this Mary Kay Lash Primer it really helps my mascara to adhere to my lashes & makes it last longer. 5. Blush Brush- I use a brush I got in a kit a few years back by Borghese. 6. Concealer Brush- I use Mary Kay Cream Eye Color/Concealer Brush to apply my concealer primer, concealer, & finishing powder under my eyes; I will also use it to apply concealer over blemishes or red spots on my face. 7. Concealer Primer- I got Benefit Stay Don't Stray in Light/Medium for Christmas & am obsessed with it! It works wonders to prime under my eyes & to extend the wear of my concealer. 8. Brightening Powder- This Laura Mercier Secret Brightening Powder is amazing, it sets my concealer & brightens up under my eyes, seriously everyone needs this stuff. 9. Concealer- I started using Benefit Boi-ing in 01 Light back in December & love it, it gives great coverage & a natural finish. 10. Eyelash Curler- I've been using Shu Uemura Eyelash Curlers for years because they are the best on the market. 11. Blush- The color of Benefit CORALista is perfection, it gives you a sun-kissed flush, which really spruces up my complexion. These are what I need for a quick makeup look. I know it may seem like a lot, but it is all really just used to cover imperfections & enhance natural features, which is what I want in a makeup look. I really need to get around to doing individual reviews on these products with application tips, especially the concealer primer, concealer, & brightening powder, because recently I learned some great tips from the makeup artists at Sephora. Hopefully in the next couple of weeks I'll be able to get that together! 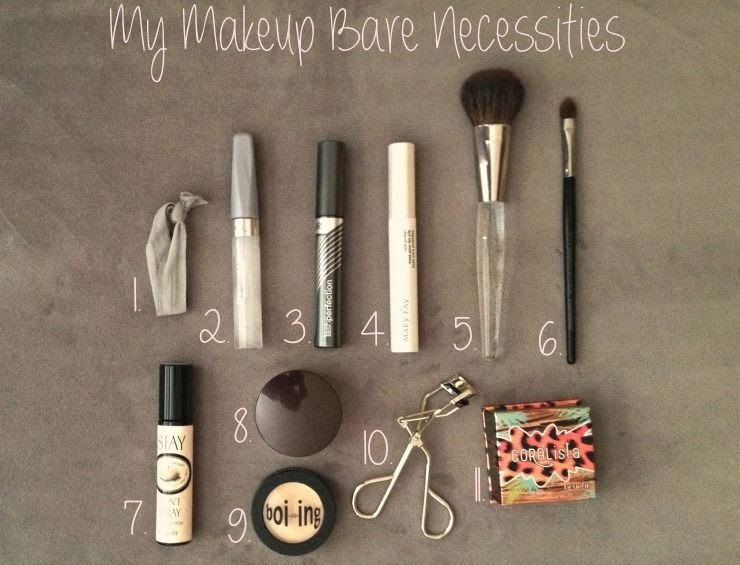 Do you have your makeup 'bare necessities' or do you always bring along all your makeup with you? Today I'm linking up with Glossy Blonde & Karly Kim! 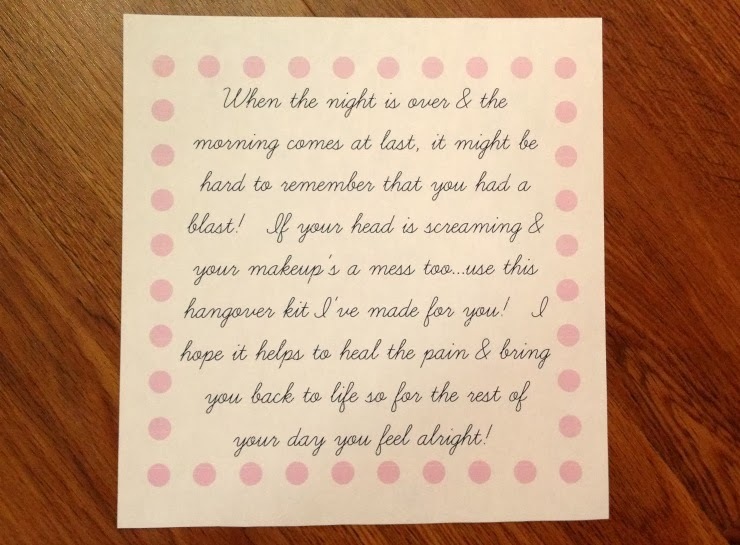 Today I wanted to share my favorite craft that I recently made for someone: A Hangover Kit. 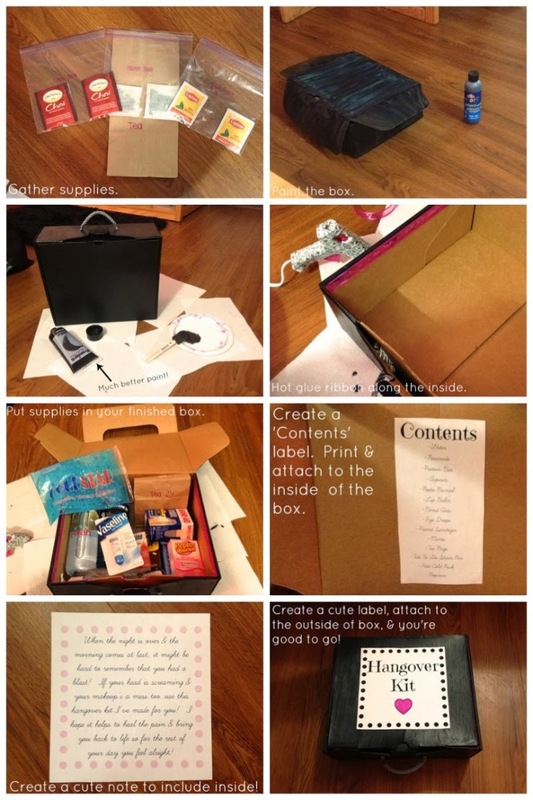 I'm not even sure where I got the idea for it, but this kit would be perfect to give out at a bachelorette party, 21st birthday, wedding, or any other fun party event! 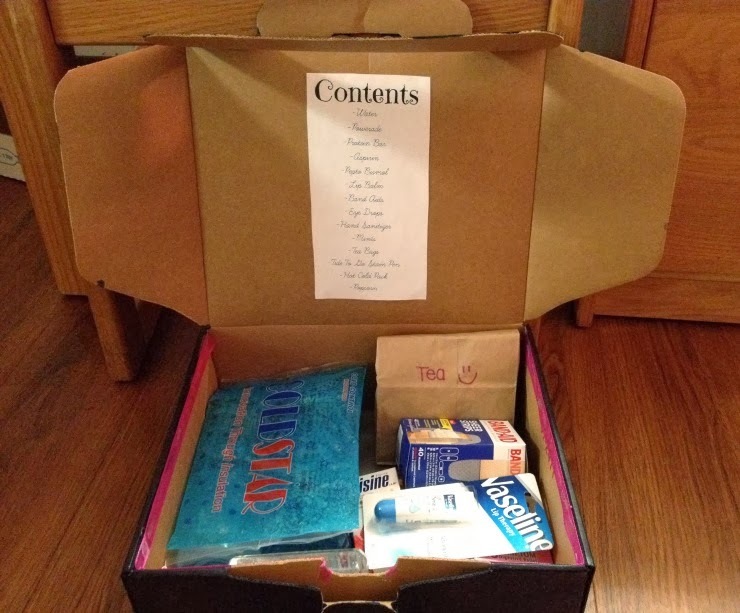 To be honest it will even work for a little 'get well' kit if someone is sick, so it can really do double duty. -With the tea: I wanted an assortment so this is how I put them together! -With the paint: I did two coats of Elmer's Art Tempera Paint (with dry time in between), but it came out very streaky so I switched to my favorite Premiere Acrylic Paint & it had a much nicer finish. 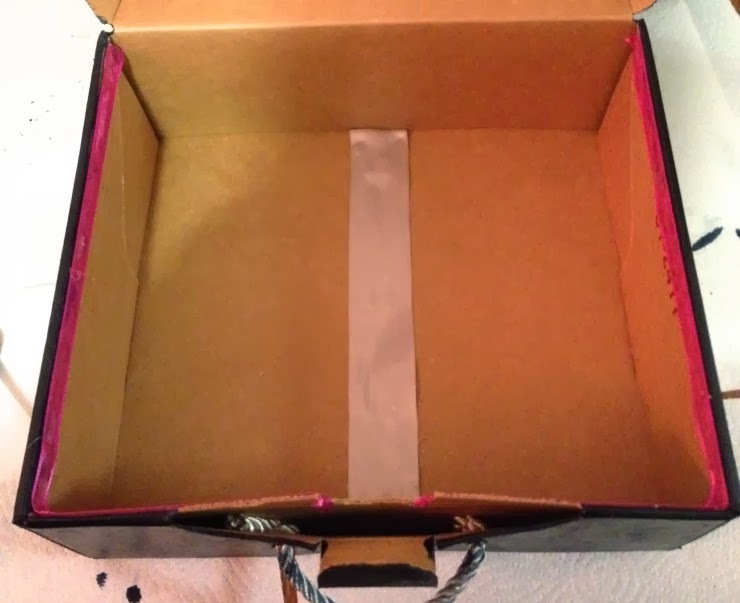 Make sure to allow the box to completely dry! -With the ribbon: I glued the ribbon along the top & along the seem of the inside box to hide paint mistakes & to overall make things look nicer. -With the contents: Make sure to arrange them nicely! 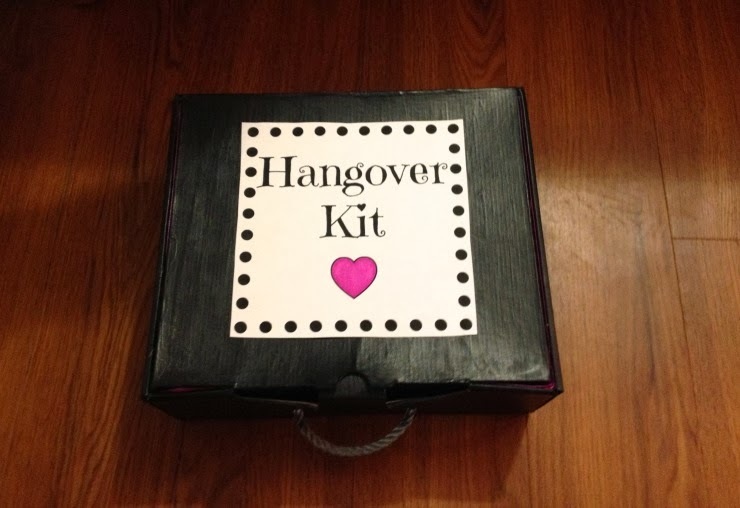 These are all the steps & supplies for the perfect hangover kit! Like I said this can be given as a gift for a multitude of occasions, & is something that you can personalize. I think that all of the work that goes into this makes for a special gift that anyone would love to get! If you want any of the documents for the labels or for the note inside, or if you have any questions feel free to email me. On a separate note I hope that you are all liking the changes around here! I had so much fun redoing my design over the weekend & am loving how it turned out. I just feel like this is just so much more me with the pink, I do not know how my previous design did not have my favorite color in it! Thanks for stopping by & have a great day!